Exam season is known for causing stress, sleepless nights and... humour? Some brave students have pushed through the negative feelings generated by exams to use this time for fun jokes for their fellow students. Today we're sharing a light-hearted look at some of the best student jokes for exam time. What better way to cope with exam stress than a good old fashioned sing-a-long? That was the plan of engineering students at the University of Toronto, who decided to express themselves musically during a first year exam. They organised a singing flashmob to help relieve the stress of fellow exam-takers. In the middle of a very silent exam, a single brave individual stood on their desk and started singing, and was soon joined by others. The students decided to vent their frustrations in the style of one of history's most famous group of students – the barricaded Parisian students from the musical Les Miserables. They performed a version of the song “One Day More” changed to “One Test More” to reflect that feeling of never-ending dread that accompanies exams. Here's hoping that the fellow students found the show of camaraderie inspiring as they wrote their tests. We all know that feeling – it's the last week before your exams, and you're stressed, tired, and constantly trying to cram more information into your brain before the big test. So off you go to the library, desperately hoping that you can predict what material will be coming up on the test and prepare yourself. Not fun! It's a time of stress and misery for a lot of students. At the Vaughan Secondary School in Ontario, Canada, the music department decided to stage a musical intervention to support the stressed-out students during exam week. A group of students with ukuleles and signs congregated outside the school library to surprise those revising with a performance of the classic song “Don't Worry, Be Happy”. They got all the students singing along and helped everyone to relax and feel better. What a lovely way to diffuse exam stress. Another Ontario student, Zaid, decided to help his fellow university students blow off exam stress in a more hands-on manner. During exam week, he prowled the university campus armed with two pillows. When he saw a student looking stressed, he'd toss them a pillow and encourage them to vent their frustration by engaging in a good old fashioned pillow fight with him. In the library, at the gym, in the quad – wherever stress relief was needed, Zaid and his pillows were there to provide it. His fellow students embraced the spirit of the pillow fight, taking the opportunity to let rip with their fluffy weapons. But Zaid pushed the prank a bit too far when he tried to get a passing police office to join in. The officer was, according to Zaid, “really nice” and gave him just a warning. But that confirms it, unfortunately – the police are not generally amenable to pillow fight-based exam stress relief. But wait! You didn't think it was only students who got to pull pranks, did you? Reddit user smileyboiii uploaded the final exam set by a cantankerous university professor. Featuring statements like “You have been provided with a razor blade, a piece of gauze and a bottle of Scotch. Remove your appendix.” (a test of medicine) and “There is a red telephone on the desk beside you. Start World War III.” (a test of politics, naturally), the test begins with an instruction to answer all questions. Just as well that all the instructions are not actually questions then – the students merely had to hand in a blank sheet of paper. This might be a good lesson on reading comprehension – but wow, pretty mean! There were surely a lot of panicking students that day, but I bet they never forgot to carefully read the instructions again. 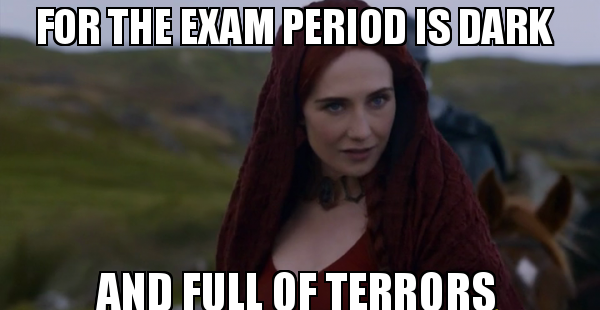 If you're deep in the exam trenches, then we hope that this brought a smile to your face!